THE SPLASH OF LADY HARRIETT by Rachel Anderson GIVEAWAY! The Splash of Lady Harriett When wills clash and hearts collide, who will come away victorious? Author Rachael Anderson A USA Today bestselling author, Rachael Anderson is the mother of four and is pretty good at breaking up fights, or at least sending guilty parties to their rooms. She can't sing, doesn't dance, and despises tragedies. But she recently figured out how yeast works and can now make homemade bread, which she is really good at eating. If there is any reaction, boy are transformed. 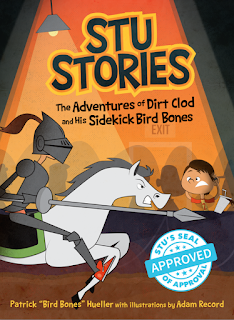 Carl Jung"
Stu Stories: The Adventures of Dirt Clod and His Sidekick Bird Bones by Patrick Hueller SPOTLIGHT! You know you want to read this book! Look at this cover! Read the description! Then look at the author picture! (Yes, I used a lot of exclamation points. Middle grade books do that!). Book Summary: Stu Sanderson is no ordinary eighth-grader. Almost seven feet tall, he vanishes into thin air, duels knights with ninja stealth, lifts the downtrodden, and woos the coolest, best-calved girl in school. Become a middle-grade legend with Stu and his sidekick, Bird Bones, on the journey of a lifetime in Stu Stories. There are so many good love stories out there. One of them is mine (had to throw that in there) though my is nonfiction. Shall I tell you the story? I promise you won't get too bored. It involves a foreign country, Americans, and a cute boy. The summer after I graduated from high school my friends (mostly girls) and I left the US of A to teach English in Taiwan. It was a good gig: good moeny, see new sights, learn different customs. Ugh. It was a long flight over. Then the humidity was like 100%. And Taipei smelled strange and most people were brown and spoke a different language. The culture shock hit pretty fast. The good thing was I was surrounded by Americans who helped me get a job, figure out which bus to take and how to order food.